Danny O'Regan was named Hockey East Rookie of the Month for January. The 5-9 center topped all Division 1 freshman with 11 points (4g, 7a) in six January games. Currently, he's second on the Terriers in scoring with a 9-13-22 line, a point behind Cason Hohmann. The Boston Hockey Blog tweeted that Sean Maguire will get the start in goal Friday at UMass-Amherst and that right wing Evan Rodrigues is expected to return to the lineup after suffering a hand injury against Providence. This Saturday night at Walter Brown Arena, BU Head Coach Jack Parker will join BC Head Coach Jerry York to present the MVP Award when their high school alma maters—Catholic Memorial (Parker) and BC High (York)—mark the 50th year of the two schools' hockey rivalry. 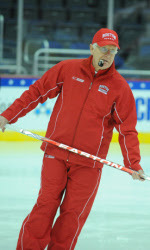 The milestone game also marks a half century of the rivalry between college hockey’s two winningest active coaches. When the puck dropped for the teams’ first confrontation—on New Year’s Eve of 1962—Parker was CM’s first-line center and York was BCH’s first-line left wing. The CM Knights earned a decisive win that evening, 7-3, with Parker and York each registering a pair of goals. The two continued to be on-ice opponents at opposite ends of Commonwealth Avenue, followed by four decades behind the benches as rival coaches, while becoming college hockey icons: Parker at BU and York at Clarkson, Bowling Green and BC. 2013 recruit Robbie Baillargeon’s sixth goal in 13 games since joining Omaha helped the Lancers defeat Sioux City, 5-3, tonight. The right-shot center has 13 points for Omaha and 28 points overall this season. Matt Christians, who authors the Bulldog Country blog, has prepared a list of prospects committed to Hockey East teams, detailing their current team, statistics through Jan. 23 and anticipated year of arrival on campus. He’s also done the same for the other conferences. The Hockey East list show six recruits for 2013, three for 2014 and one each for 2015 and 2016. We’ve added Bulldog Country—HE recruits to the list of links in the sidebar. Luke Popko, BU’s top defensive center on the 2009 national championship team, is continuing his career in Poland’s Elite League with HC GKS Katowice where he has an 8-12-20 scoring line in 35 games. Former BU MVP John Curry was named ECHL Goalie of the Week for the week of January 20. Freshman Jordan Juron was named Hockey East Rookie of the Week, marking the fifth time this season a Terrier had received that recognition. Juron, who last year captained Assabet Valley to the U-19 national hockey, scored a pair of power play goals and added an assist in BU’s 5-2 win at Vermont.